CEBU CITY-Coming from a solid boxing pedigree, Dave Penalosa (14-0-0, 10 KOs), wants to extend his unblemished boxing record. The 27-year old Cebuano southpaw is targeting the vacant World Boxing Organization (WBO) Oriental featherweight title next month. The young Penalosa will be up against tough Mexican boxer Marcos Cardenas (19-6-1, 15 KOs) as the main event of another boxing extravaganza on February 16 being lined-up by no less his uncle, Gerry Penalosa, the Chief Executive Officer (CEO) of GerryPens Promotions, Inc.
His father Dodie Boy Penalosa, himself, a two-time former world boxing champion like his uncle, revealed a rigid training regimen for his son. The venue is the mountainous trek of barangay Busay here, where many professional boxers would attest to the challenge and advantages of having a sort of a high-altitude training. “Ako ning gipatangas sa bukid sa Busay, pa-kondisiyon gyud sa away, (I let him run the mountainous area in Busay, to really condition him for the fight), the elder Penalosa told this writer in an interview. Dodie boy said the morning run to Busay alternates with their gym work and sparring aimed at preparing his son well for the 12-round championship fight since Cardenas is no pushover. The Mexican has height advantage and has fought against world rated Filipino boxer Genesis Servania and current World Boxing Council (WBC) super bantamweight champion Rey Vargas. “Taas ang Mexicano, maayo sab muduwa unya idlas, mudagan-dagan, (The Mexican is taller, he is also a good boxer and slippery, he loves to run in the ring),” Dodie explained. Cardenas stands 5 feet and 9 inches while Dave is 5 feet and 6 inches tall. Dodieboy said they trained in Cebu for a month and will continue it in the Penalosa Araneta gym in Cubao, Quezon City. The younger Penalosa was impressive in his two last fights. In September 30, 2018, he knocked out in just two rounds the erstwhile Tanzanian featherweight boxing champion, Twalib Tuwa. Earlier in August, he also dominated Indonesian journeyman Ricky Manufoe in his return to the ring in Tagbilaran City, Bohol after a hiatus of almost three years. 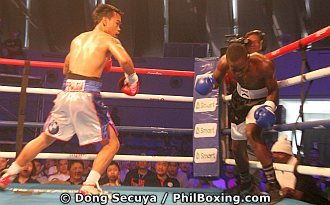 The venue of the February fight will be the Skydome of SM North EDSA, the same place where the Penalosa-Tuwa fight was also held. According to Gerry, he will work out a possible world championship fight for Dave if his nephew will show another impressive performance in the fight against Cardenas. The bout will be aired live on television via ESPN5.